There are two parts to a commercial electricity bill: Energy charges are based on the total amount of electricity you use, while demand charges are based on your highest “peak usage”. These demand charges are determined by the highest 15-minute average usage recorded on your demand meter that month. In other words, if your facility only uses a lot of power briefly, your entire monthly bill will have demand charges based on that brief peak demand. If your power use is more consistent throughout the month, your demand charges will make up a much smaller part of your bill. Electric utilities issue demand charges to help offset the cost of delivering a consistent level of energy to their customers. When tens of thousands of customers are simultaneously maximizing their use of electricity, the utility’s ability to deliver electric service is strained. Demand charges are applied to help pay-down the costs of maintaining the utility’s delivery system (the power lines) and preserve power availability for all customers across the grid. Additionally, demand charges are intended to incentivize customers to both reduce their peak energy usage, and shift their energy usage to non-peak times of day. As a result, utilities charge higher rates to customers with highly variable energy usage and charge lower rates to customers with more consistent energy demand. See what DemandQ can achieve in your industry. Demand charges primarily impact commercial and industrial energy customers. Even though commercial and industrial customers might only experience a single peak demand event during a given billing period, that single random demand peak can drive 20-50% of your total cost of electricity for the entire month. And while the general price of energy is decreasing, demand charges continue to grow. 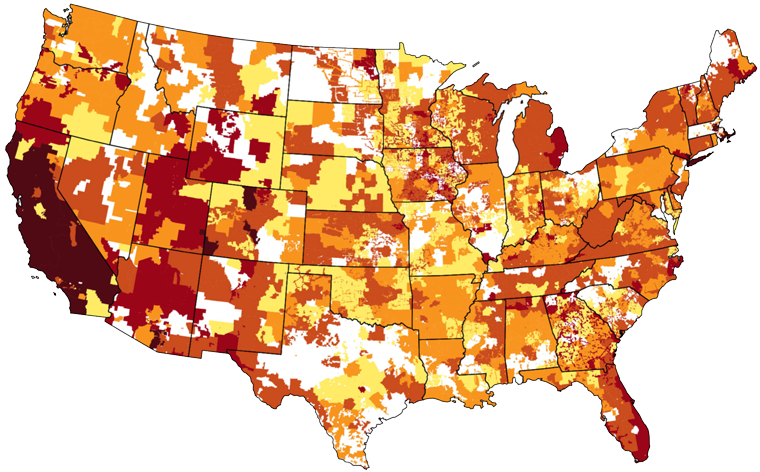 Demand charges vary by state and season, and by electricity provider, but there are utilities in all 50 states that issue demand charges for peaks in energy use. Utility demand charges significantly impact energy costs across much of the US and are increasing 8% per year. Peak demand charges make up 20-50% of a commercial site’s monthly electric bill.